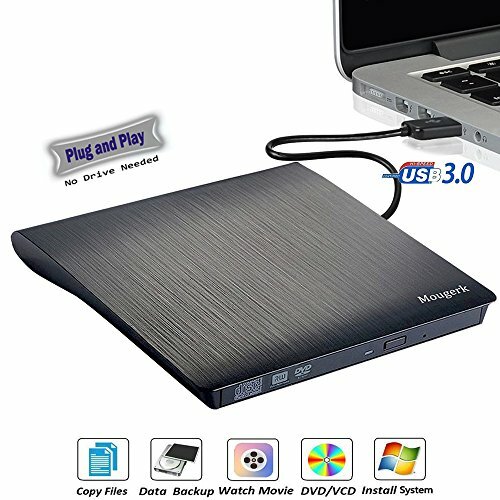 Mougerk provide slim portable fast USB3.0 CD/DVD burner, you can watch DVD movies, burn files, movies to a CD/DVD, install software and create backup discs etc. Compatible with Windows 10 / 8 / 7 / XP, Linux, system and Mac10 OS system. Click on the desktop, open the "my computer", in "the mobile storage device should display the drive icon"
Click on this icon button, select the "pop" in the tray into the appropriate disk read. Compatibility: WindowsXP/2003/Win8/Vista/7, Linux, Mac 10 OS system, NOT compatible with higher Mac10 OS systerm. 1, Before you using the CD-ROM drive, make sure your computer has a "Media Player". 2, Please hook up the device to the direct USB port on your computer. If you connect it to a USB hub or extension cords, it maybe cannot recognize the Driver or not read the CD/DVD. 3, For the desktops, please connect the device to the USB port of the motherboard for normal use. 4, Product is tray loading external portable ODD caddy which is suitable to USB 2.0/3.0 connector desktop or laptop. 5,Compatible WindowsXP/2003/Wind8/Vista/7, Linux, Mac 10 OS systerm, NOT compatible with higher version than OS X Yosemite. 6,No extra drive, support plug and play, no need to install the driver program, support plug and play. 7,Data cable with pure copper braid process, anti-interference ability, signal attenuation, more stable data transmission. *The Mougerk trademark is only licensed to Mougerk for sale on Amazon. If a seller sells fake Mougerk products, please report it to us and you will be rewarded. Mougerk specializes in the production of DVD drives, our products are new and 100% fully tested, and have the best after-sales service.Please choose sold by Mougerk. *PLUG and PLAY, Don't need to install software to set for driver. It features strong error-correcting ability, anti-shock and noise reduction technology, low power consumption, and powered by the USB port, no external adapter needed. No drive needed.ENJOY YOUR LIFE, Your can watch DVD movies, CD musics(make sure your computer has a "Media Player") and you also can do: install Windows system/copy/backup. *12 months product warranty, 30 days product Replacement or Full Refund if you are not satisfied. If you have any questions about this product by Mougerk, contact us by completing and submitting the form below. If you are looking for a specif part number, please include it with your message.